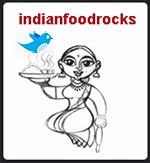 Indian Food Rocks: Uh huh! You thought I'd forgotten? Nope. Over on The Daily Tiffin, y'all! Kitt, just under! I had to finish writing the DT article first! Cellphone is fodder for another post! HKG, thank you and same to you! I hope you had a great celebration! And, anyone seen my fly swatter? Awwww! I was just kidding!